It was the 24-year-old Beethoven’s Opus 1 piano trios that his teacher Haydn advised were just too something-or-other for the public, in-your-face and avant-garde. No. 3 sinned in particular, implied Sandra Hyslop’s typically informed notes for the Trio Solisti’s program Sunday evening at the Shalin Liu Performance Center. 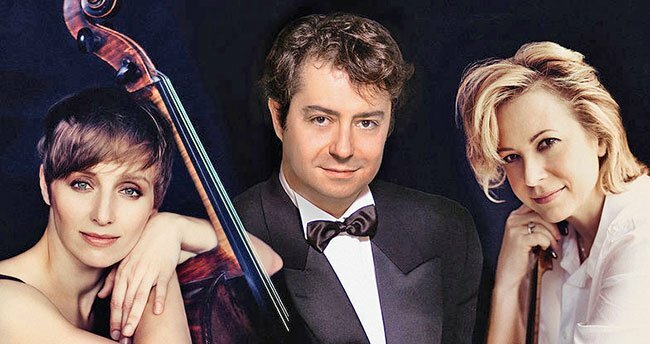 The trio comprise violinist Maria Bachmann and cellist Alexis Pia Gerlach with new pianist Fabio Bidini (their third in four years). During the close-to-wild performance—loud in the good sense, unhomogenized in the good sense, everyone discretely stepping up, spurring one another, yet not covering anyone else—it occurred to me that maybe Haydn was a little jealous of his pupil. That’s actually unlikely. But in this work there is so much “I’m going to seriously show off, then just screw around, then yank some rugs,” not to mention that it’s plainly funny in so many places, sly and hammy, that the master could hardly have helped feeling envy. Trio Solisti made much of the piece’s best characteristics at every harmonic and rhythmic turn, rough, ready and/or laugh-aloud; the second movement’s fourth variation featured bravura pianism from Bidini, and the Scherzo featured faultless, mouth-agape (mine) descending runs by all. Beethoven’s surprising continuations-over-rapids were pokes to the ribs, if I may mix images; eventually, in an odd ending, the music simply stops. “Imitative” is not the kindest adjective for a contemporary work, but Lowell Liebermann’s Piano Trio No. 3, written during the 2012 election and premiered then by this group, sounded to these ears like a very fine extension / update of numerous Shostakovich chamber pieces. It is especially suited to this summer of Trump, the fire-pants. From hanging opening chords with high strings hovering anxiously, later flipped to the moodiest of strands and lines with piano filigree, to a menacing jazz processional (Liebermann’s words; the score indication reads “They’re coming…”) to the hysteria of an Ivesian faux-patriotic ending, this trio should be the accompaniment to a better version of the 1974 paranoid movie classic The Parallax View. I want to rehear it and shall also seek out other efforts from this 55-year-old composer. Brahms’s magnificent Opus 8 Piano Trio is always touted now for having been uniquely reworked from a youthful garrulous examination of early sadness (friends found it “vague” and “puzzling”), revisited, torn apart and recomposed into major-to-minor existence as the potent entity we revere today. Biographer Jan Swafford wisely points out that “perhaps no composer in history would have still been close enough to his youth” to achieve such a result. At Brahms’s best, as here, I find the disciplined, intently crafted constraining of deep passion into dignified forms (this is not an original observation) simply awe- and ache-inspiring, every single time. Somehow his music feels more usably emotional, more effectively moving, than others’, full of force informed by a kind of nobility, ever subtle and shapely. Although her playing often sounds very beautiful, Maria Bachmann is not interested chiefly in beauty, rather more in dynamic qualities and apposite phrasing, with a certain muscularity. And although her playing often sounds very rich, Alexis Pia Gerlach is not concerned chiefly with richness, rather more with structure, and inflection, sometimes with marked extroversion (one Brahms chamber fan felt there was rather much of that). Both musicians express themselves with more slidy-swoopy portamento than one hears today (or ever, recently) from other string virtuosos; perhaps they aim for a style and sound akin to what Brahms would have known. For his part, Fabio Bidini manifested throughout, and outstandingly in the Brahms, large and powerful sound, while also subtle, in the very best Yefim Bronfman manner. Chamber-music connoisseurs should absolutely not miss Trio Solisti.